Québec, November 29, 2018– Stelmine (STH-TSXV). 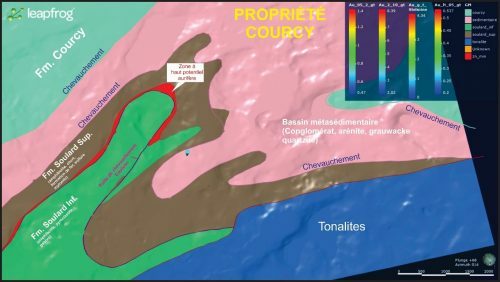 Following the exploration work completed on its Courcy flagship property over the last two years, Stelmine can correlate the gold mineralization with a major fault zone (the Couteau fault) which extends 21 km. Best gold assays are provided by pyrrhotite-rich amphibolite and iron formation samples within or near this major fault. “The association between gold mineralization and a 21 km-long fault bodes well for the development of the potential on this zone. 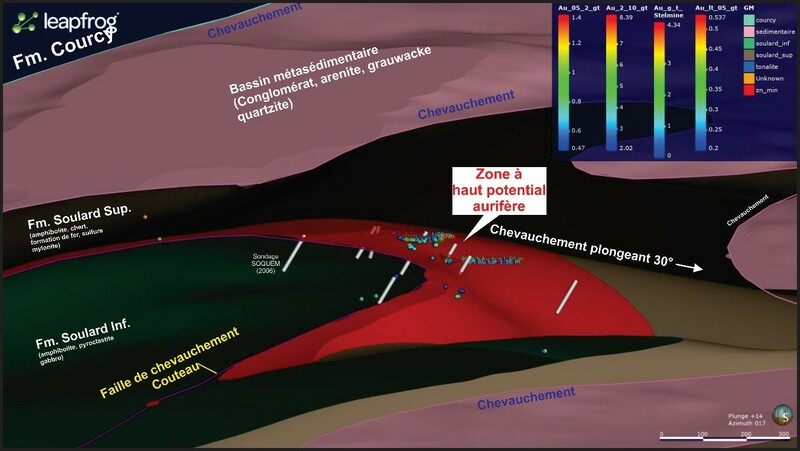 In fact, the most interesting assays provided from earlier drilling (4.27 g/t Au on 42 m) and a mean value of 0.74 g/t Au on 42 m from channel samples are located on the trace of this fault.” says Isabelle Proulx, president. 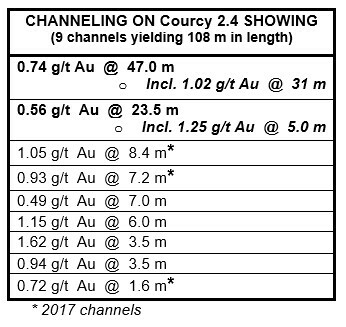 A detailed structural mapping campaign conducted simultaneously by Dr. Normand Goulet on 13 gold-bearing showings allowed the definition and a better knowledge of the structural context in which gold was deposited. In order to prepare its future drilling campaign, Stelmine build-up a 3D model illustrating the various rock assemblages and geological formations composing the Courcy property (Figures 1, 2). The model was constructed by integrating the geological and structural data and the interpretation of the geophysical surveys. The 3D model indicates the Couteau fault was associated with a first deformation event and, conjointly with the two other thrust faults limiting the contact with other rock assemblages, was refolded during a second deformation episode generating ENE-folds dipping moderately toward the east (Figure 1). The general view of the property shows the Couteau thrust fault defining the gold-mineralized contact between the Lower and Upper Soulard volcanic formation along with the zone of highest gold potential. The Soulard Formation is mainly composed of amphibolites (metabasalts), occasionally pillowed, of intermediate tuffs, cherts/quartzites and of iron formations. The gold mineralization infiltrates the Couteau fault and adjacent units on a 5 to 20-m estimated thickness in structural traps (fold hinges, strongly folded and mylonitized zones). It is contained within highly deformed and metamorphosed layers rich in semi-massive to massive sulphides associated with garnet porphyroblasts, quartz, plagioclase, hornblende and pyroxene. Stelmine geologists have identified the Couteau fault on several stripped outcrops at the core of a large antiform exposed near lac Couteau principally at the site of a fold hinge at the Courcy site. A Close-up view of the principal gold-mineralized zone at Courcy (Figure 2) displays the eastward – plunging Couteau thrust fault. and zone of highest gold potential following the contact between the Lower and Upper Soulard Formation. The localization of surface mineralized samples collected during the 2017 exploration campaign are on or near the trace of the fault principally within the Upper Soulard Formation. Stelmine implemented a strict QA/QC protocol in processing all rock samples collected from the Courcy property. The protocol included the insertion and monitoring of appropriate reference materials, in this case high concentration (OREAS-210) and low concentration (OREAS-252) certified gold standards, blanks and duplicates, to validate the accuracy and precision of the assay results. All collected rock samples were put in sturdy plastic bags, tagged and sealed in the field under the supervision of professional geologists. The sample bags were then put in rice pouches and kept securely in a field tent before being sent by floatplane to the city of Wabush. Transport to Actlabs laboratories in Ancaster, Ontario was made by truck from reliable transport companies. Gold was analyzed by fire assay method (Au-FA_ICP). Stelmine is a junior mining exploration company which concentrates its activities in the Province of Québec. Stelmine holds 955 claims spanning 497 km2 on the eastern part of the Opinaca metasedimentary basin, which contains zones with a high potential for gold deposit discovery in geological contexts similar to the one leading to discovery of the Éléonore Mine. Its capital stock consists of 29,648,645 issued and outstanding shares for a current market capitalization of $4.6 million.